Located between Ason Chowk and Indra Chowk is this fabulous temple courtyard known as Jana Bahal. Although the exterior archway was destroyed in the 2015 earthquake the Seto Machchhendranath temple and courtyard survived unharmed. Jana Bahal is well worth seeking out due to it's eclectic number of statues and shrines. The well preserved temple is also unique in Kathmandu. Just outside Jana Bahal are several small street markets which often obscure the entrance way. The mighty Seto Machchhendranath temple is just behind them in its protective metal fence. There are also two versions of Machchhendranath. A red one found in Patan and this one who is known as the “white Machchhendranath” or Seto Machchhendranath. In 2018 renovations to the surrounding area of Jana Bahal may block the main entrance way - do look for a gate or door in any fencing that will let you officially enter the courtyard. Jana Bahal has many hidden secrets including a pottery square. Do see my guidebook to Kathmandu to discover all this and more. The main temple itself is dated from the 17th century however inside the temple there's a statue that predates it by 700 years. The White Machchhendranath statue inside the temple was built by King Gunakamadeva in the late 10th century. Shortly afterwards it was stolen by invaders from the west. The invaders couldn't carry it though so they threw it into a river. The western king who stole it became infected by a skin disease as were his descendants. An astrologer linked the events and the statue was found before being brought back to Jana Bahal. Soon after the temple was constructed to house the statue. Jana Bahal's courtyard is filled with shrines and statues. For historians it is of interest to note the unusual gilded statue of a woman. Some suggest it’s the mother of Buddha, Maya Devi. Her look is far too similar to a European-styled figurine for others. Today she is adorned with red-vermilion. Perhaps her identity can be found in the temple itself. There is no fee to enter Jana Bahal or any of the surrounding temples. Currently is looks closed due to reconstruction at its main entrance. But there's a way beside the old entrance in the front. This entrance changes position as the fence is often moved during reconstruction. The temple itself is still open. From Ason Chowk head directly south towards Indra Chowk. Halfway between to the two popular chowks is a small junction. Jana Bahal is to the right. 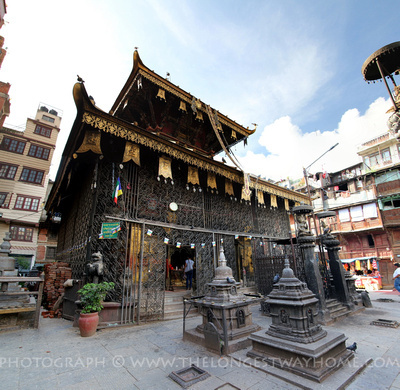 Seto Machchhendranath temple contains one of the oldest statues in Kathmandu!